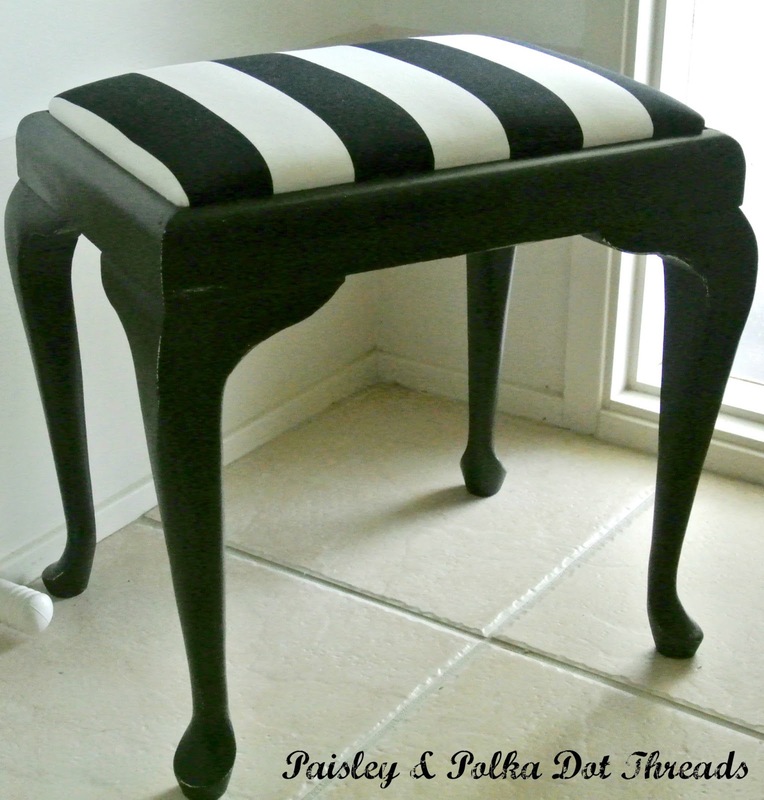 Paisley & Polka Dot Threads: Happy New Year and a Vintage Stool Makeover! 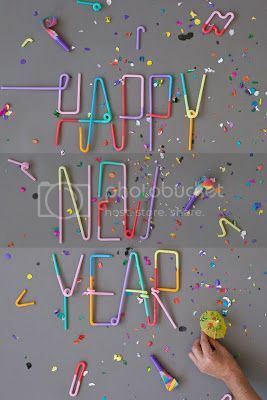 Hope your year has begun beautifully and you're enjoying all January's new beginnings. I'm still thinking about my 2013 goals and I'm hoping to share them over the weekend. In the meantime here's my first project for the year... a vintage stool makeover! 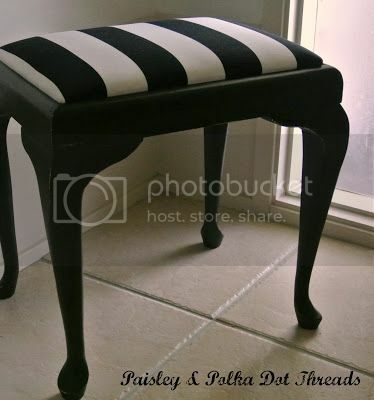 I LOVE these stools. I can be a little lazy when it comes to hanging my clothes, so if they're not ready for the wash, they always end up getting laid over a chair or stool until I need them again . And some times (Ok hardly ever) I'm so organised that I'm laying things out the night before! I used a matt black over white undercoat, so the distressed corners show white. I think the colours suit the classic vintage style - without being plain old white. And I have I told you I love stripes? I picked up this fabric a while ago at Ikea and this was my last piece... means another trip to Ikea right?? These pictures also give you a sneak peak at my entry makeover, something I'm hoping to finish by the end of January. 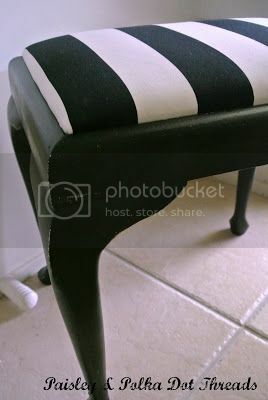 I've been madly painting (I like stripes, can you tell?? ), op shopping and decorating - I really would like to have ONE room finished these holidays. Cross your fingers for me! ooh i love it! it's classic in black and white! bravo! it looks awesome, catherine. hope you'll pop over when you have a moment, lovely blogger. 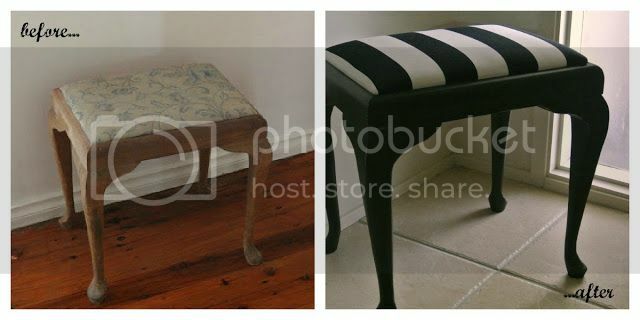 Your bench transformation is wonderful! 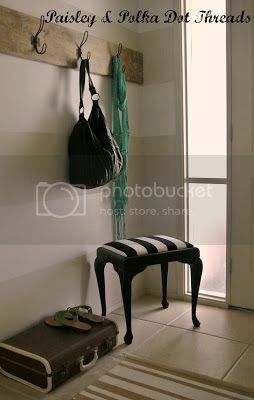 Love the stripes on both the bench and the wall. Glad to have found your blog. I am now following and look forward to your future posts.